I've been doing some lab work configuring a NetApp ONTAP solution where I use a SnapVault image as my data source for backups. It all seems to work quite well and I can see the snapshots on both my primare and secondary storage systems via the Veeam Console. 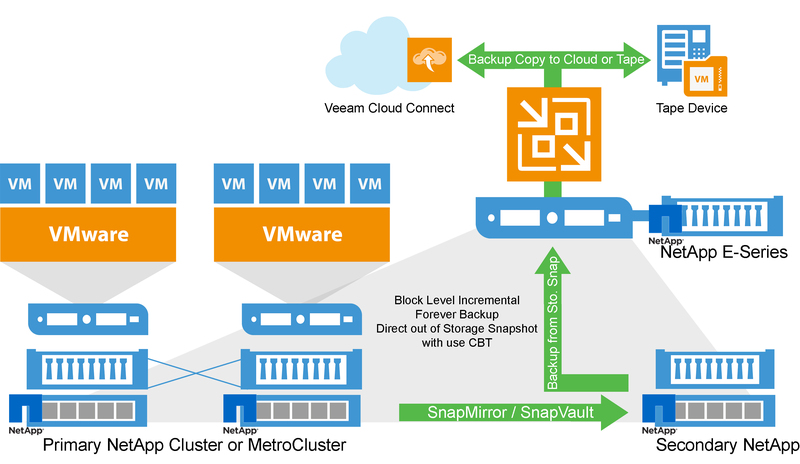 The only thing I can’t figure out is how to do an Instant VM Recovery from SnapVault. Whenever I try I get an error message saying “One or more VMs cannot be restored to the original location, because it is no longer available, or the host has outdated integration components. Please choose different restore mode”. I’ve presented the NFS SnapVault volume to the same host as the source volume and everything else seems to be working. Any ideas what I might be doing wrong? My issue when I first tried was I didn't make a mount point to the snap mirror. Open NetApp and create a mount on the protected volume just like it was a real volume. Then assign the rights to the mount point. Then when you browse in Veeam it looks like the snapshots at the main site. The really cool part is the instant restore, mount a VM from the mirror snapshot at the DR site in Veeam, this takes only a minute and the VM is running. My DR backups use this mount now which makes remote backups real fast because they are really local. I could at this stage use OnCommand tools to do a recovery but I'd really like to get the full integration working. BTW, File Level Restore from the SnapVault copy works fine. mine shows me the VM names in the mirror copy. At first mine did what you are seeing but I thought my fix was above. Will need to look for notes. did you right click the mirror in storage infrastructure and pick rescan. If you fixed the problem the VMs name don't appear until you rescan. Yep, rescanned both storage systems and virtual infrastructure. I would call support then as I know it works. I'd check license requirements as well. I thinks i found my answer veeam-backup-replication-f2/instant-vm- ... 42126.html. It seems this is a known issue that is solved by v9.5 Update 2. I'll be giving it a try later. Update 2 solved my problem. I still get an error message saying “One or more VMs cannot be restored to the original location, because it is no longer available, or the host has outdated integration components. Please choose different restore mode”. But now I can choose the option to restore to a different location and choose any host to complete the restore. Hi Marc, are you saying that you still cannot select an alternative location for restore after installing Update 2? This behavior is currently expected.